WILLEMSTAD - The government categorizes the publication about the Queen Juliana Bridge on social media as fake news. 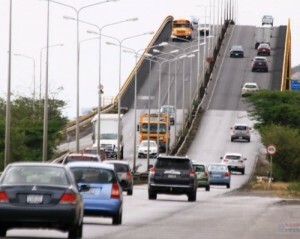 The publication says that the Queen Juliana Bridge is in poor condition and is not safe. But according to the Ministry of Transport, Traffic and Spatial Planning, there is no danger. On the basis of information from the Public Works Department (DOW) it is stated that the construction is stable, despite the fact that there is indeed 'small pieces' of oxidation. In accordance with the maintenance program of the bridge, the asphalt of the bridge was replaced in 2013 and maintenance work was carried out on the railings. In 2019 a project will start for the total renovation of the bridge. The rust formation is mainly addressed in several parts of the bridge. To remove this, a special method with water pressue will first be used, after which a new layer of paint will be applied to protect the bridge. Maintenance work will take place in collaboration with the Dutch Rijkswaterstaat experts and will be completed in 2021.